Benjamin G. Carter passed away suddenly Saturday, August 25, 2018 after a long-fought battle with addiction. Like most who struggle with addiction, it did not define him. Ben was a kind and caring partner, father, grandfather, son, brother, uncle, and friend who will be missed dearly. 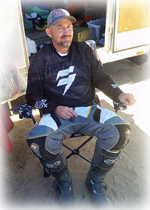 Whether it was boating in Lake Powell, riding dirt bikes in the sand dunes, or working on the family dragster in the Salt Flats, Ben was always the life of the party. His sense of fun and zest for life was absolutely contagious. Ben had a great sense of humor and enjoyed making people laugh. Leading by example, he taught those around him to live and love with dedication, enthusiasm, and above all courage. Ben's passing leaves a hole in the lives of his family that can never be filled. In October, 2017, Ben's daughter Carlee passed away and took a piece of his heart with her. Our family takes comfort in knowing that Ben was received into her loving arms. Ben is survived by his sweetheart, Shelly; his children Courtney, Skylar and Jace; his grandchildren Cooper and Ashton; his brothers Clint and Aaron; his sister Alisha; and his parents Lindsay and Sheryl and Gary and Cindy. Funeral services will be held Thursday, August 30, 2018 at 12:00 p.m. in the LDS Ward Chapel located at 56 South 1300 West, Pleasant Grove, Utah with a viewing from 9:00 a.m. - 11:45 a.m. prior to the service. Interment will be in the Pleasant Grove City Cemetery. Condolences may be sent to the family at www.olpinmortuary.com. In lieu of flowers, the family asks that you honor Ben's memory by donating to Addict to Athlete to help combat the opioid epidemic in Utah. Donations can be made at http://addicttoathlete.org/donate/.